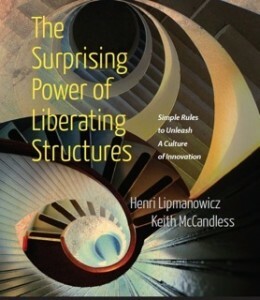 What are Liberating Structures? At the first level, they’re a set of 33 practical, easy-to-use methods for group work. And last month, the whole body of work came out as a book, The Surprising Power of Liberating Structures. Authors Henri Lipmanowicz and Keith McCandless spent years gathering, testing, codifying and describing these processes in real-world settings. And here’s the Liberating Structures website. The heart of the book is the “Field Guide” to the 33 Liberating Structures. Each one takes the group down a different path. For example, the Nine Whys is a process to help “make the purpose of your work together clear.” This process that asks why, why, why. In 20 minutes it helps both the individual and the entire group dig deeper to get greater clarity on what’s important. What’s the underlying reason we’re doing what we’re doing? Lipmanowicz and McCandless have also identified “Sets of Strings.” These are combinations of the 33 structures that, when used together move a group toward a goal, such as drawing out prototypes or finding everyday solutions. But this whole Liberating Structure is open source, and we’re encouraged to find our own strings, as well. The book tells stories of Liberating Structures helping in different settings: the classroom, a child-welfare system, a business turnaround, and so on. Because of their easily seen impact, these approaches to group work will undoubtedly find quick acceptance from many tribes. An earlier post on Liberating Structures by Erin Stock.